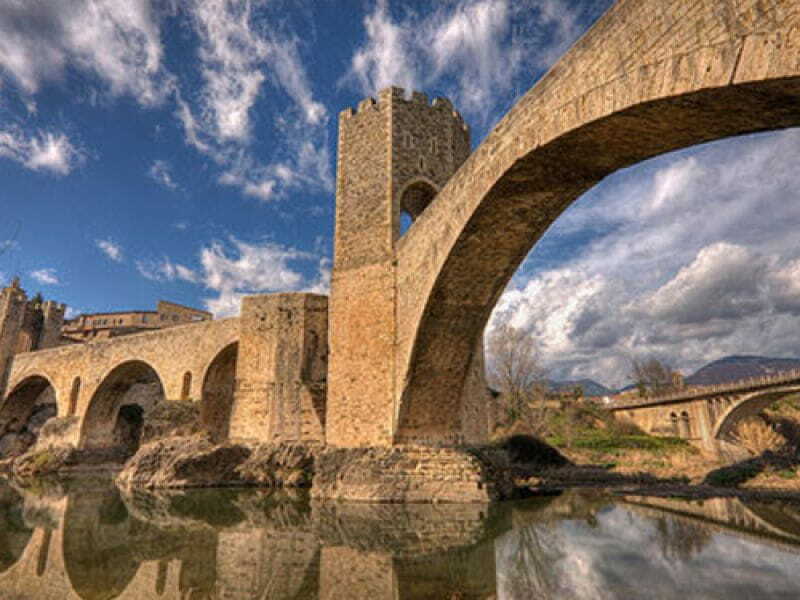 Besalu is one of the most important medieval sets and very preserved in Catalonia. Its geographical location favored human settlement was installed in the time reculados and has been a meeting place of various cultures that have enriched the architectural heritage of the town. 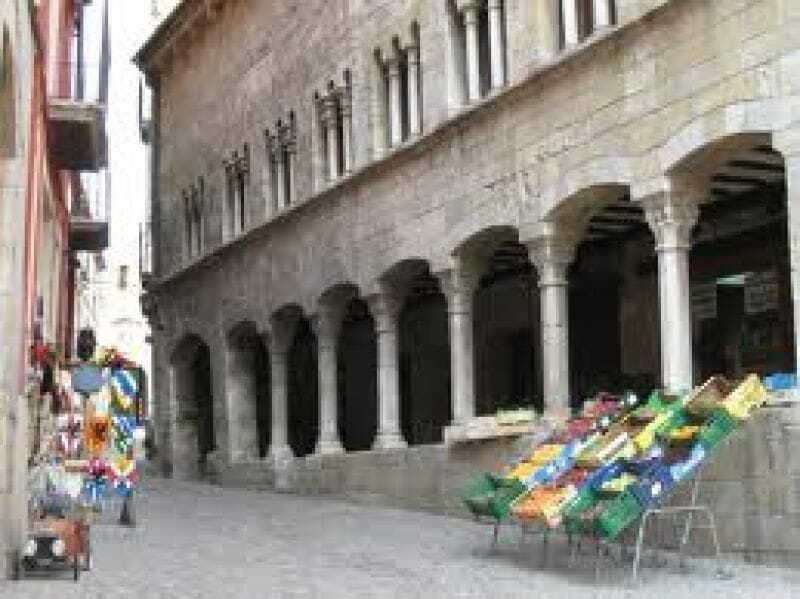 As you walk along the streets and squares, which have a strong medieval flavor you can meet and visit the different assets that make it so unique. 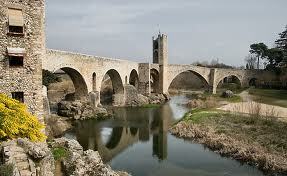 Besalu is a population of the Garrotxa region , located 150 meters above sea level and has an area of 4.81 km². 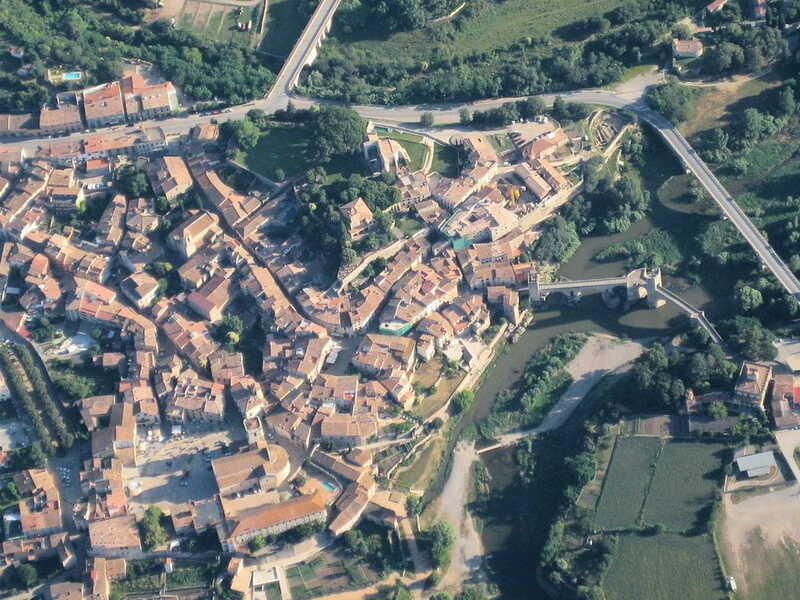 As originally stated, Bisuldunum was a fortress between two rivers: the Fluvia Capellades south and north. 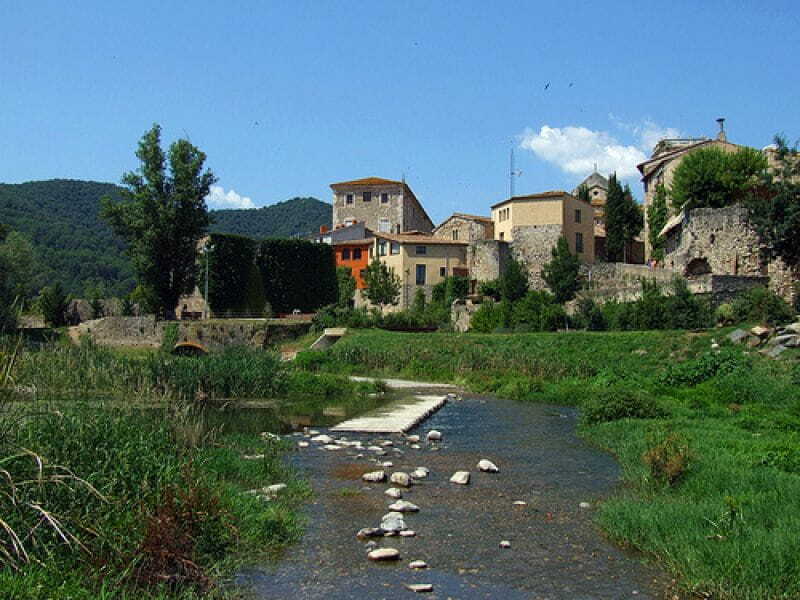 Enjoy good communication to meet at the intersection of three counties: Alt Empordà, Pla de l'Estany and Garrotxa. 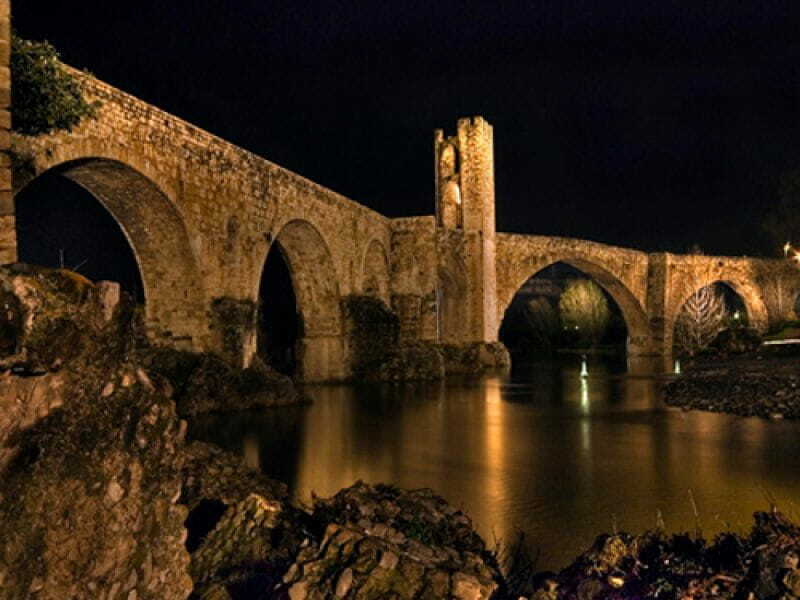 Besalu began to gain importance as independent county seat after the death of Wilfred the Hairy (902) lost by dying condition Bernat III- son of Ramon Berenguer III- no sons, as a result, the county went to the house Besalu of Barcelona. The 1966 was declared "National Historic-Artistic" for its architectural value. The first reference we have to the bridge dates from the 11th century, and it has been rebuilt a number of times over the years. It has seven arches and is characterized by its angular form, a result of the placing of the pillars over the natural stones of the river. It is 105 meters long and 30 meters high, including the defense tower. 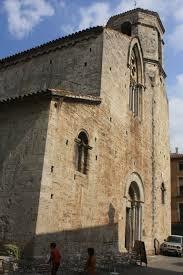 In the medieval times, a county pagus was installed in the fortified tower, an obligatory toll paid to enter the town. The bridge was dynamited during the Civil War and later rebuilt by the architect Pons Sorolla, under the criteria of the State Architecture Office. It is now the symbol of the town and the most suitable entry point into the old town. 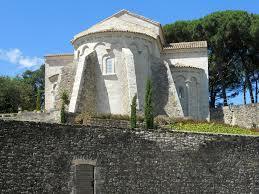 Of the Benedictine monastery there only remains the church, notable for its grandiosity. 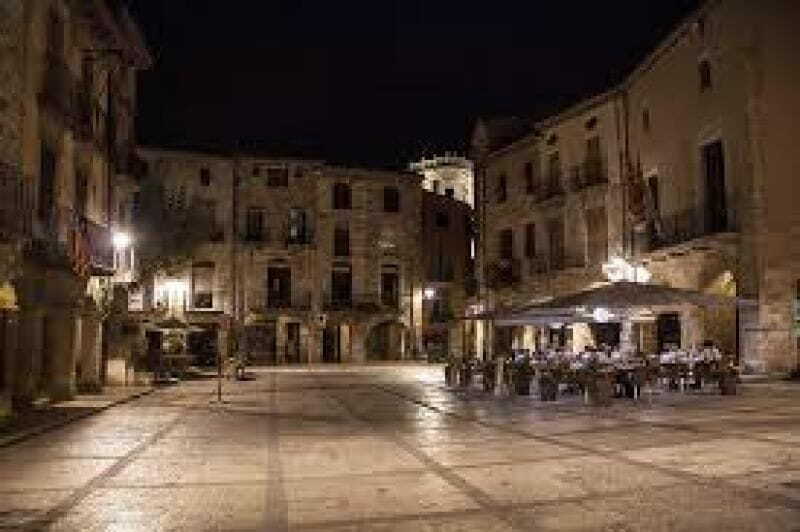 It was founded in 977 by Count- Bishop Miró and consecrated in 1003 by the most important count in the history of our county, Bernat I, known as ‶Tallaferro”. The Benedictine community was initially made up of twelve monks, and in 1111, the year when the county was abolished; the abbot became the town’s highest authority. The monastery enjoyed great political influence during the 12th and 13th centuries. 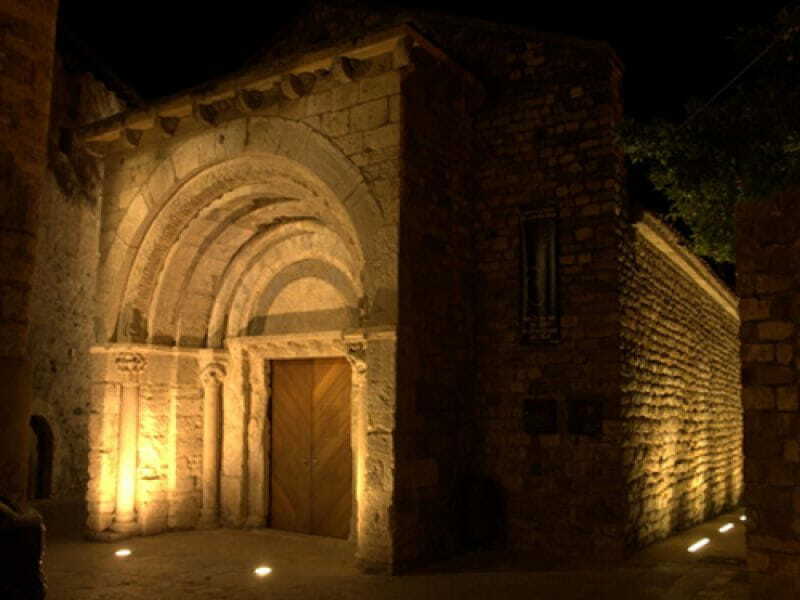 This church is unusual in having an ambulatory or aisle used exclusively by pilgrims in medieval times, where the relics of Saints Primus and Felician were venerated. 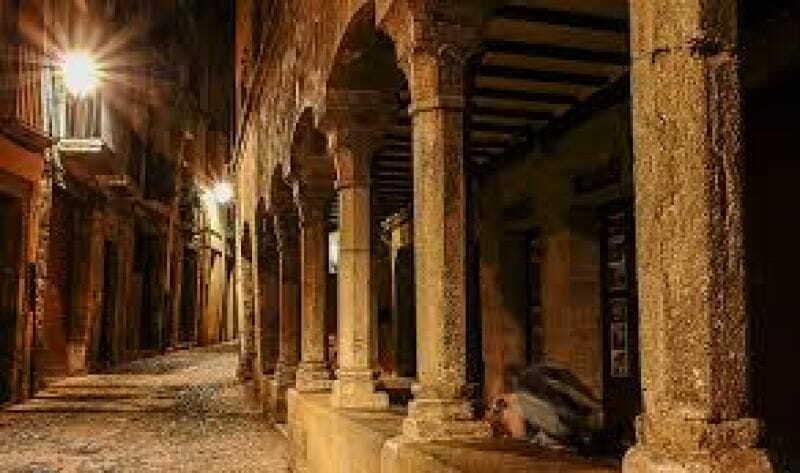 In those days the town wan an important pilgrimage point, and the old hospital of Sant Julià was a hostel for pilgrims. The eight columns separating the ambulatory from the main altar are crowned by capitals engraved with biblical scenes, plant motifs and mythological animals. Inside the church lie the tombs of the most notable abbots of the monastery and a common grave for the monks. 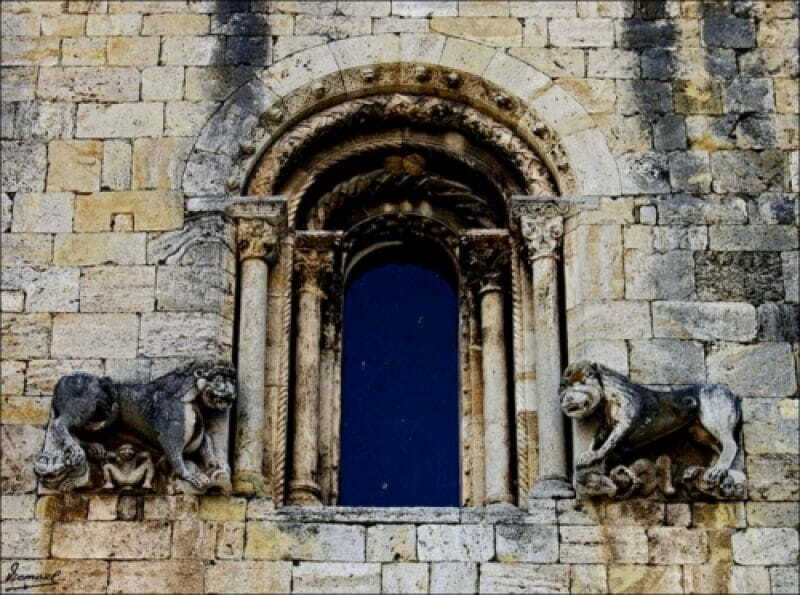 The façade of Sant Pere has a unique large window where two lions symbols of the strength, power and protection offered by the church can be seen opposite evil and paganism, represented by a monkey and a man. People were protected from evil once they entered the church. 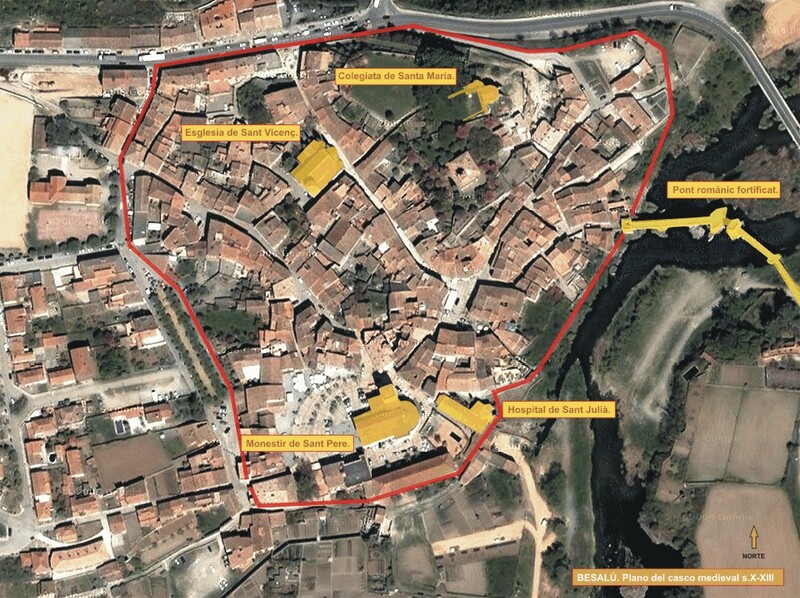 Is situated within the precinct of the old count´s castle, of which very little remains. 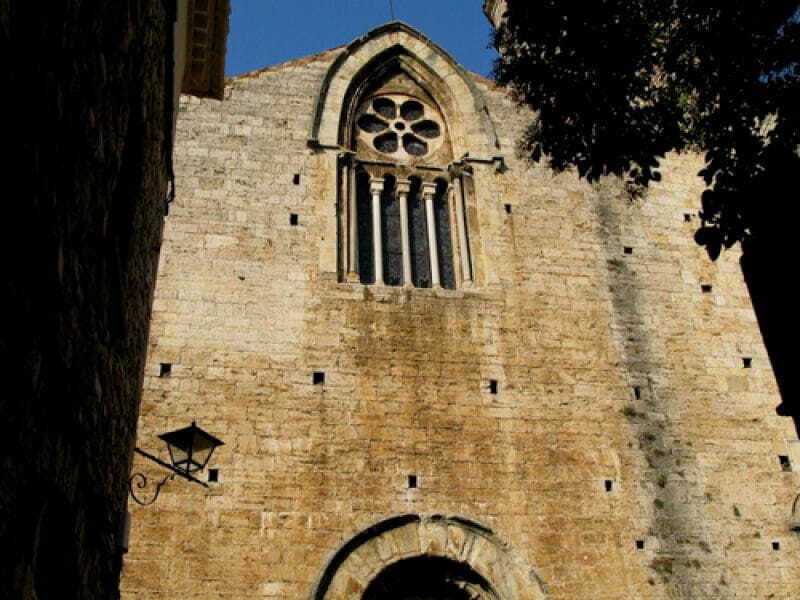 Originally, it was built as the church of the castle, but on the disappearance of the county of Besalú as an independent entity, the church became an Augustinian canonry. 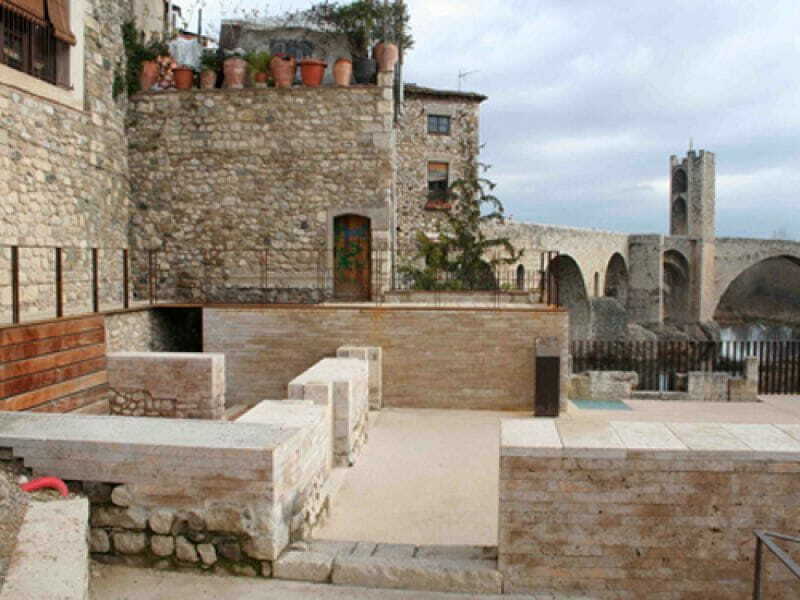 The original building was raised in the 10th century, but in the 12th century experienced a profound reconstruction that led to a church with a basilica ground plan with three naves. The little that remains today belongs to that period: a head with transept and three apses with feature and the characteristic Lombardy arches and Romanesque capitals. This canonry was extinguished in the 16th century, and the church was transformed into a collegiate, and in the 19th century, with the sale of Church lands ,what remained passed into private hands, and this meant that it was abandoned and a large part of its architectural elements sold. The miqvah was unexpectedly discovered in 1964, beginning with the upper part. 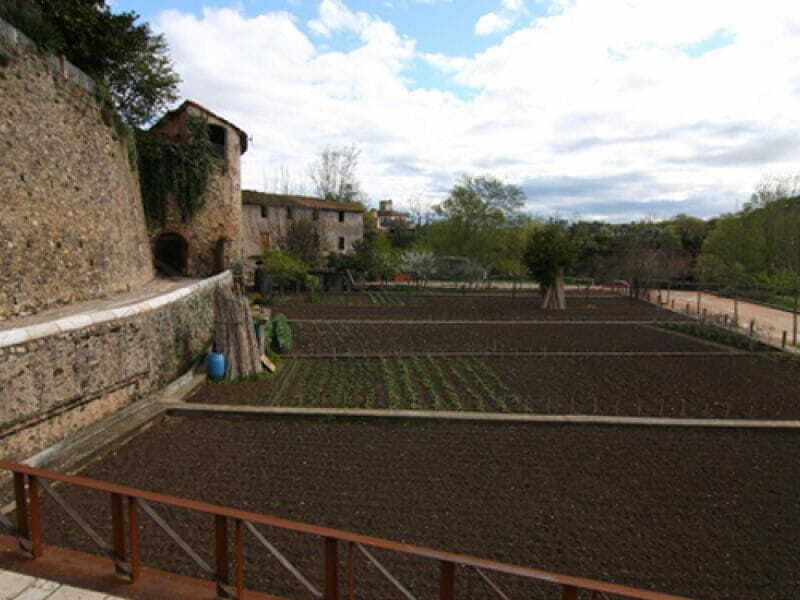 It is the first and only building of this type found in Spain and is the third largest of the tens till conserved in Europe. 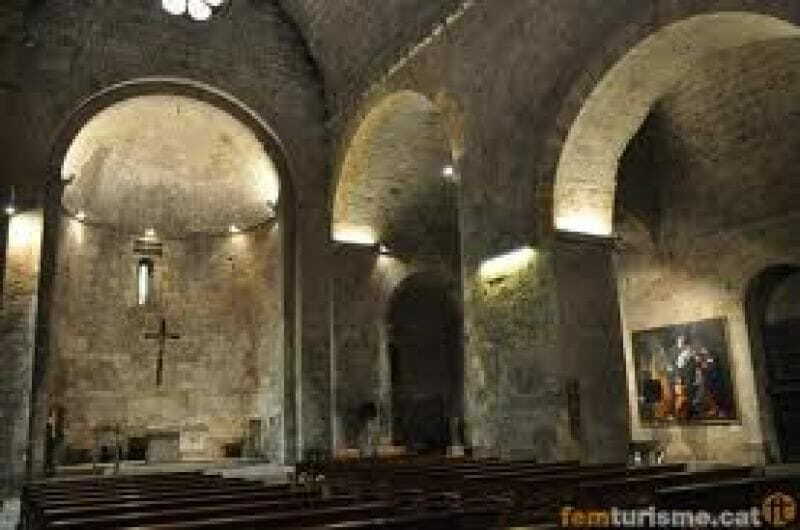 It is an underground hall in Romanesque style, built with hewn stone. 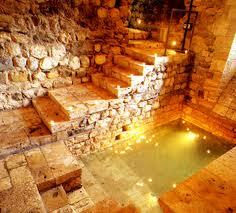 It has a loophole window in the east wall, a barrel vault and a ritual cleansing pool. 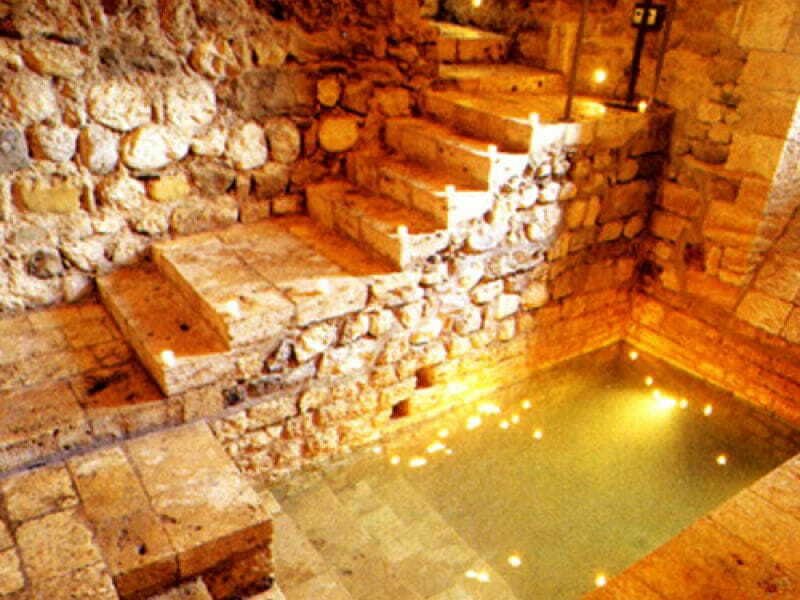 Each miqvah, depending on its location, was filled with water from a fountain, a river, a lake or the sea, with no piping or channeling involved, which is why they are all located a few meters below ground level. Their function was the purification of the soul through the total immersion of the body. Jewish women used to cleanse themselves a few days after each menstruation, after childbirth and before marriage. Religious men usually cleansed themselves every Friday before sunset, that is, before the start of de Sabbath, and whenever they had been in contact with a dead person. 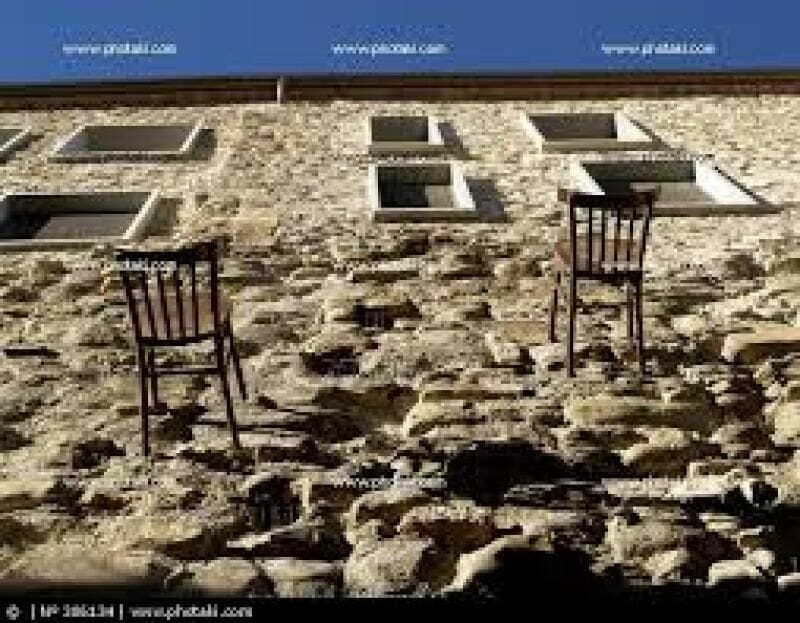 This building is situated at the point hwre the “Jews’ square” is documented and where archaeological research has recently uncovered the remains of the wall of the old Synagogue of Besalú, documented in 1264. From this small square there is a view of the symbol of the town. 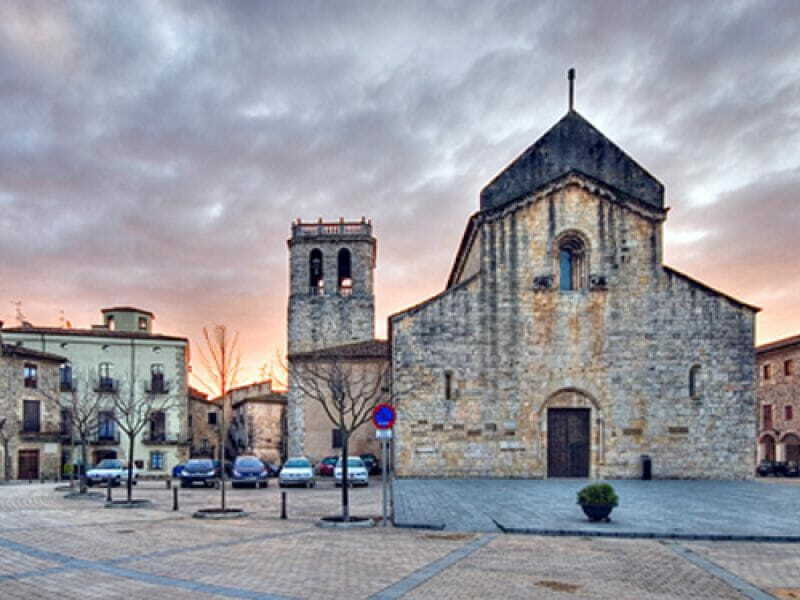 Documented in the year 977 in the time of Count-Bishop Miró, this is the town’s parish church. 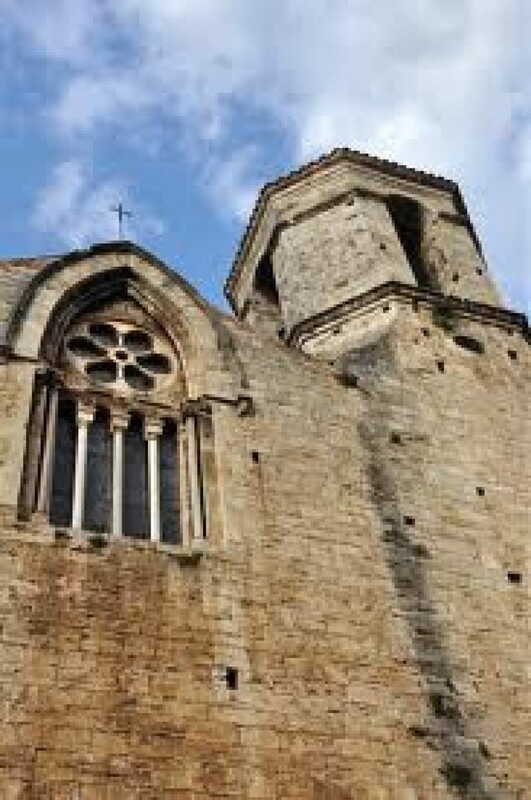 It is a Romanesque construction with certain elements of the transition to Gothic, such as the rose window and the main window. 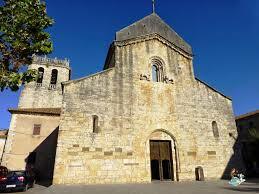 Inside we find the Gothic tomb of Pere de Rovira, who brought the relics of St. Vincent to Besalú in 1413. A Gothic side chapel constains the True Cross, presented by Francesc Cambó in 1923 to replace the original one, brought from Rome by Bernat Tallaferro in 1017 and stolen in 1899. 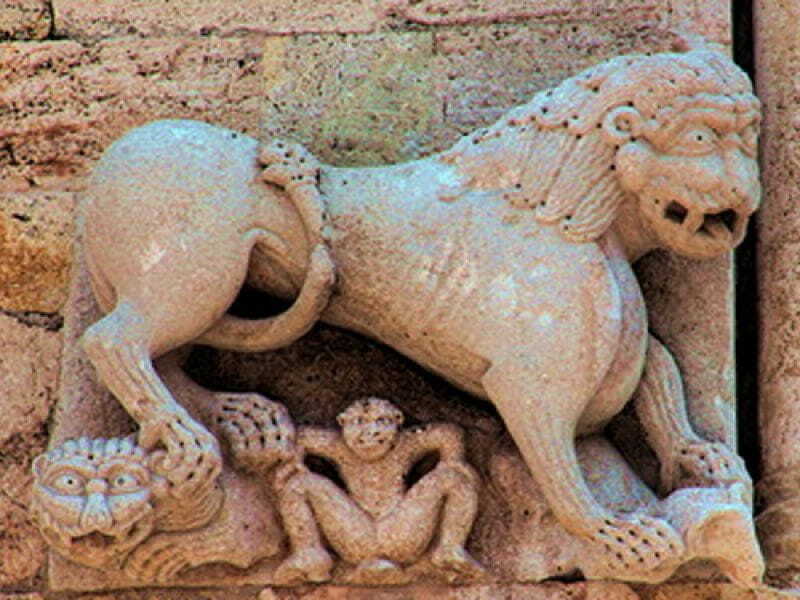 Considered one of the best-conserved Romanesque civil buildings in all Catalonia, this mansion dates from the late 12th century and has a classic Romanesque civil structure. 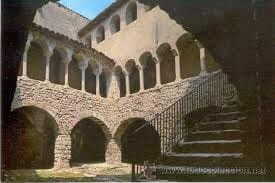 On the ground floor were the stables and servants’ quarters; the first floor, with its magnificent round-arched gallery, was the living area of the Cornellà family; and the top floor held the granary- One of the house’s distinguishing features is its structure, organized around a courtyard that allows daylight to enter all of the rooms. The house passed from the Cornellà family to the Llaudes family, and is now owned by the Solà-Morales family.